Are you the Webmaster of a small aviation web site? Do you work at a big aviation portal? 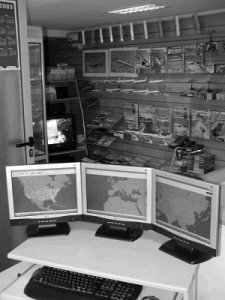 Do you own an aviation related shop? 200 sales partners selling our products on their websites and shops. Register as an affiliate today. As easy as entering your email and placing a banner on your site. AirNav Systems has a new affiliate project that will enable you to earn a commission of 20% (except for RadarBox and ShipTrax hardware which have a commission of 10%) of each order made by every customer you send us. It is completely free to join and the setup takes only 10 minutes. AirNav Systems will also be responsible for Customer Support - you don't have to care about it. When visitors click our link from your site, we send them a cookie which designates you as the referrer. The cookie is valid for a full month. If that visitor becomes a customer anytime before the cookie expires, you get the credit! On the 15th day of each month, we update your account activity statistics so you can see how many referrals, trials and upgrades you've sent us. You will also receive a check for your commission. 2- Fill the following form. All fields required. We will then add you to our affiliates database. 3- After you click the button above you will be guided to our Affiliates Resources page where you will learn how to place an AirNav Systems banner on your page.